Finally, the 35th single of Morning Musume was out. All lyrics are made by Tsunku. The songs are nice, this year morning musume always gave us new sounds. 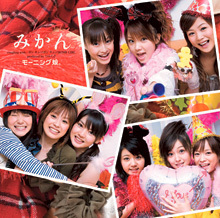 Another nice one after “Onna ni Sachi Are”, a must for momusu fans^_^. The single is uploaded by me and the PV is by kecoa_langit. Please give him your regard too!! This entry was posted on November 25, 2007 at 8:21 pm and is filed under Downloads, Morning Musume, Single with tags 35th single, Mikan, momusu, Morning Musume. You can follow any responses to this entry through the RSS 2.0 feed. You can leave a response, or trackback from your own site.